In this “how small can we make it” world, it was inevitable that podcasting would merge with iPhones, iPads and other iOS devices. Now, it is possible to carry an international radio station in your pocket or shoulder bag. That was unimaginable not even a decade ago. It is not news that podcasting has left traditional broadcast radio in the dust. Podcasters — the very best ones — create far more innovative programming for their niche audiences that old school broadcasters ever did for the mass market. As a result, podcasting has unleashed a huge amount of creative talent throughout the world. Along with that talent, what has changed in recent times are the tools used by those podcasters. They moved from using personal computers to more powerful iOS devices. Along with this shift came an array of tiny and improved accessories, that when combined, make podcasting more portable than ever. Of course, podcasting has always been driven by talent. The talent to take a good idea — a solid story — and communicate it to an audience in a compelling way. But having lighter and simpler gear to operate can enable those with the talent to go much further with their production values. The simplest and easiest way to record a one-person podcast is with a USB microphone feeding an iPhone. This bypasses the need for drivers, cables and the complexity of other audio devices in the chain. A specialist in this area is Apogee, who has produced the best portable mics since 2011. Apogee’s new MiC Plus ($249) is a small, professional quality USB microphone that works with virtually anything — from iOS to Macs and PCs. It was designed for voice recording or live streaming. The MiC Plus has a new design with improved sound quality, dynamic range and built-in headphone output for latency-free monitoring while recording on any device. It has a professional-quality cardioid capsule, high sensitivity and ample gain. It is indistinguishable, says Apogee, from a high-end mic with a top quality preamp. Yet it can fit in a pocket. Just plug it in and start recording. 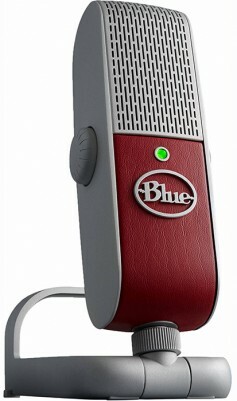 Of course, there are many more great USB mics, including Shure’s Motiv MV51 ($199) and the Blue Raspberry ($159.99). All the top quality USB mics have different feature sets and characteristics and should be auditioned to find the right one for a particular voice. To connect a favorite XLR mic to an iOS device, IK Multimedia’s iRig Pre HD ($99.99) is a compact, single-channel audio interface that features a switchable 48-volt phantom power. It has a high-quality Class-A mic preamp, dedicated rotary controls for microphone gain and headphone level and multicolor LEDs for gain. It also has 24-bit A/D and D/A converters with a 96kHz sample rate. For more than one mic and for additional production capability, there is IK Multimedia’s iRig Pro Duo two-channel audio interface ($199.99) and Zoom’s U-24 ($149.95) two channel adapter for field use. A bit larger is Tascam’s iXR USB audio adapter with iOS connectivity ($159.99). 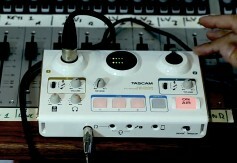 A bit more elaborate is Tascam’s MiniStudio Personal (US-32, $129.99) and Creator (US-42, $199.99). These units, designed for podcasting, give far more production control and sound effects manipulation. They begin to approach the capabilities of a traditional radio station. Of course, regardless of whether a single USB microphone or a traditional microphone mixing setup is used, never let the technological set-up drive your podcast. It’s the story, stupid — plain and simple. The story should never be sidetracked by the gear. That said, the podcaster with a few basic skills can scale the heights beyond the gear. Learn mic placement, don’t over-modulate the levels and always test the recording set-up first. These simple tips alone can save the day for any podcaster.